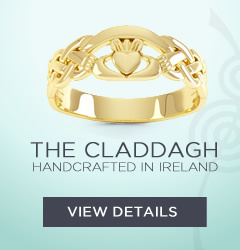 All of our jewelry is created and designed here in Ireland by skilled craftsmen to the highest standards of quality and workmanship and finished with great care. However if you are not satisfied with your purchase for any reason we have a 30 day return policy. Will my Credit Card details be secure on your website? Yes, shopping with us is 100% secure. We use encrypted security to protect your privacy. We accept all major credit cards, Visa, Mastercard and American Express and also paypal can be used for Payment. I’m having difficulty making a purchase on line, what can I do? If for any reason you are finding it difficult to complete your purchase on line please call us on the appropriate phone number Toll free from USA/Canada 1800-469-6891, 00353 879499569 (Rest of world) or email info@ardrijewellery.com and we will be happy to help you place your order. All our jewelry prices exclude Irish Value Added Tax (VAT) which is 23%. This tax will be automatically added to your bill if the jewelry is to be delivered within the European Union. Outside of the European union local duties or charges payable are the responsibility of the customer. We offer Free Shipping on many of our jewelry pieces. We send all of our jewelry by Registered post, FedEex and offer both an Economy and Express service. If you need your jewelry piece fast we can arrange this for your, please contact us by e-mail or free phone to arrange this Toll free from USA/Canada 1800-469-6891. What if my jewelry is damaged when I receive it? If your jewelry is damaged in any way please contact us immediately and we will arrange a replacement or a full refund. How is my jewelry packaged? Can I choose to send the gift to an alternative address with a specific message? Yes, during the checkout process you will the opportunity to specify an alternative address.